In the spirit of motherhood, let's talk mom hair. When I think of mom hair I immediately think of a short, easy to manage bob. Yeah, that isn't my hair. I chopped my hair off while I was pregnant, but haven't done more than a trim since. Now it is long and takes some effort to make it look decent. Don't get me wrong, I love a mom bob. I really wish I could pull it off, but if my hair is shorter than my shoulders I look 12. It is not a good look. So what is my mom hair look? 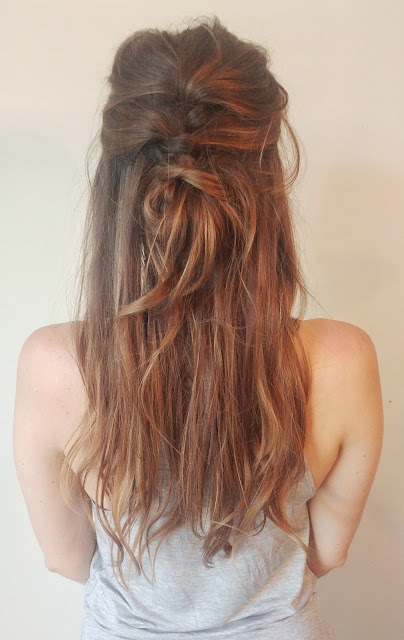 It is an intentionally messy, half up bun. I switch it up all the time. Sometimes it is super high, sometimes low, and sometimes I work in a braid. No matter what, I make it look messy because it will end up there anyway. Might as well make it look intentional right? This weekend, I did a french braid down to a messy bun. I had some 2nd day curls hanging around so that added a bit of texture to the half I left down. To keep everything in place and to get my hair to hold a messy braid/bun, I used this texture spray. I cannot stand having hair in my face, so nine times out of 10 you will see me rocking a look similar to this one. What is your go-to mom hair look? Any other mermaid moms out there?